And of course, there’s only one answer, always: to cheese. Since its inception at the hands of Willem Bos (who began the business making cheese tools for the dairy farmers of Gouda, home of the original Gouda cheeses), Boska has been making tools for those who love to explore the world of cheeses. Boska’s Life collection is all about enjoying food with friends, with a twist on traditional serving methods. Perfect for a crowd, this large Extra Large Partyclette includes eight small pans in which you can melt raclette cheeses and more, which can be kept warm by a row of tealight candles that runs the length of the board underneath the pans. It’s the ultimate way to cook and serve without electricity at the table. Frame made from wood and steel. Steel pans include heat-resistant silicone handles. Melt cheese and more in the individual pans: tealight candles can be placed in the channel underneath to keep the pans hot. Plastic spatulas make cheese removal easy. Hand wash recommended for all parts. Frame – 48cm (l) x 18cm (w) x 3.5cm (h). 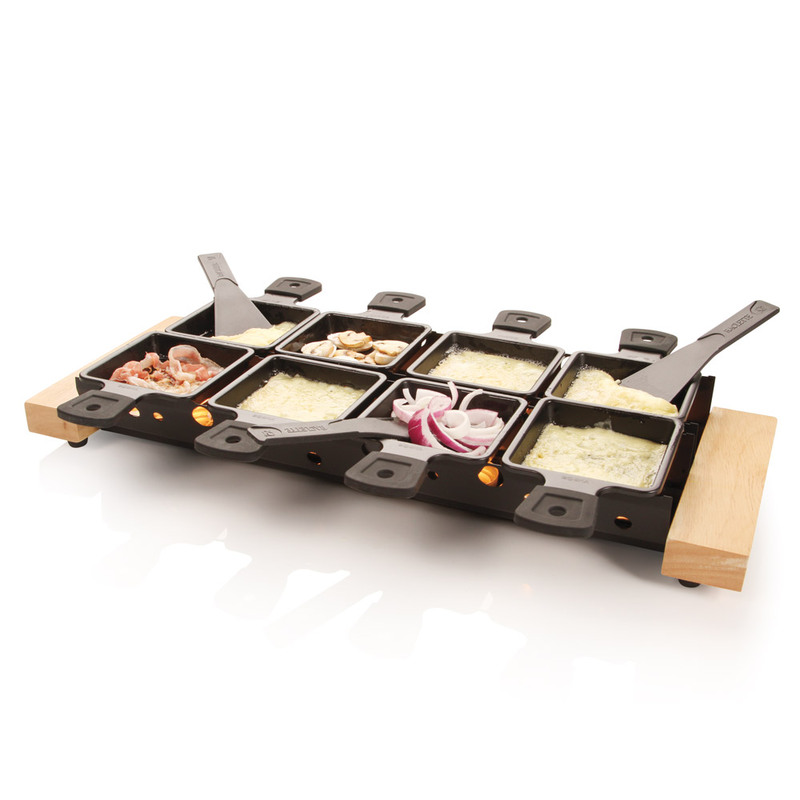 8 x Raclette Pans – 9cm x 9cm, excluding handles.